The Municipality of Anchorage has reached an agreement with a local Native corporation in a deal that will avoid years of costly litigation for both sides. 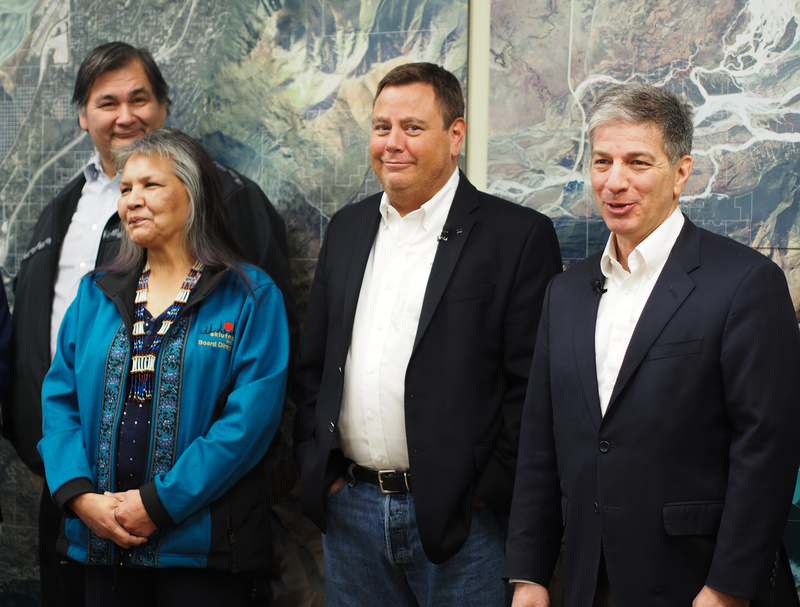 During a press conference Jan. 4, leaders from both the city and Eklutna Inc. shared details of the multi-part agreement, which include promises of new housing stock, infrastructure and cash for natural gas produced at the Anchorage landfill. “We’re all on the same page today,” Eklutna Inc. CEO Curtis McQueen said, standing before a wall-sized map of Denai’ina lands at the corporation’s office in Eagle River as he summed up the company’s special relationship with the municipality. The for-profit ANCSA company is the largest owner of private land within the municipality of Anchorage, holding 90,000 acres according to its website. Those holdings are primarily within the thinly populated neighborhoods of north Anchorage, from Eagle River to Peters Creeks. In 1982, a federal deal called the North Anchorage Land Agreement between Eklutna, the city and the state resolved ownership issues over portions of contested claims in the area, which includes the Anchorage landfill. In 2012, the city implemented an energy system that captured methane from decomposing trash at the landfill and sold it as energy to nearby Joint-Base Elmendorf-Richardson. The next year, Eklutna sued Anchorage over that sale, alleging that the city is legally obligated under NALA to split the millions of dollars in revenue coming from the trash gas at the landfill. Now, the city and corporation have reached an agreement on that suit. “Eklutna is going to waive any future claims about gas, the municipality is going to forward about $5.75 million,” Anchorage Mayor Ethan Berkowitz said. The money is a one-time payment, with $5 million coming from general government funds, and the other $750,000 paid by Solid Waste Services, the local trash utility. Going forward, any money from gas sales at the dump will stay with city. At Wednesday’s press conference, the payment was framed as a capital resource to help Eklutna build 108 residential units in the next three to five years on property it owns. Residential construction, primarily of single-family homes, is one of the corporation’s best proven abilities. And according to McQueen it was part of what they brought to the table when Eklutna began discussions around the lawsuit when the current administration came into office. The deal also laid out who will pay for utility infrastructure to the new developments. Anchorage’s water utility will front the costs for building sewer lines through, though Eklutna will pay that money back. Speakers at the press conference stressed that the agreement was worth more than the particulars of the settlement, saying it is an accomplishment just for both parties to once again be working together in good faith. “It takes good hearts to get there, not just business,” Maria Coleman, treasurer for the corporation’s board of directors, said. The deal does not need approval from the Eklutna tribal government to go forward. Tribal Council President Lee Stephan was present at the press conference, but declined to speak in an official capacity. Now, the measure is set to go before the Anchorage Assembly next week during its regular meeting.